The Nikon D5300 is a new 24.2 megapixel DSLR camera with no optical low-pass filter that can record Full HD movies at 1080/50/60p with stereo sound and comes equipped with built-in Wi-Fi and GPS. A high-resolution 3.2-inch vari-angle LCD monitor makes it easier to compose your shots from difficult angles, while the extensive ISO range of 100-25600 should cope with virtually all lighting conditions. A 5fps burst shooting mode, EXPEED 4 image processor, 39-point autofocus system with nine cross-type sensors, 2,016-pixel RGB metering sensor, High Dynamic Range mode, Active D-Lighting, and nine different special effects for stills and movies complete the Nikon D5300's headline specs. Available in three colours, black, grey and red, the Nikon D5300 costs £729.99 / $799.95 / €899 body only, or £829.99 / €1029 with the 18-55mm VR kit lens, and $1,399.95 with the AF-S NIKKOR 18-140mm f/3.5-5.6G ED VR lens. The Nikon D5300 replaces the year-old D5200 as the new mid-range model in Nikon's extensive DSLR line-up, slotting in between the existing D3200 and D7000 models, not only in terms of feature set and functionality, but also in terms of size and weight. It isn't quite as compact and lightweight as the D3200, but neither is it as bulky and heavy as the D7000. In comparison to its predecessor, the D5300 is slightly smaller and lighter than the D5200. The right-hand grip is deep and therefore quite comfortable for photographers with large hands and/or longish fingers, and there's also a handy rubberised thumb rest on the back of the body. The D5100's 24.1 megapixel CMOS sensor has been superseded by a 24.2 megapixel sensor with no optical low-pass filter, which promises to deliver slightly finer details. The sensor can clean itself by way of high-frequency vibrations that will, at least in theory, shake off any non-adhesive dust particles that may have settled on the low-pass filter during a lens change. You can specify, via an option in the Setup menu, whether you want sensor cleaning to take place at shutdown, startup, both or neither, with the default being 'both'. The cleaning process pleasingly has no practical impact on startup times, which were near instant. The new image sensor is complemented by the more powerful EXPEED 4 processing engine and a larger buffer as well. The D5300 is the first Nikon DSLR to offer both built-in wi-fi and GPS connectivity, instead of relying on optional accessories like all previous models. The wi-fi function essentially pairs the D5300 with an iOS or Android smartphone or other smart device, and allows you to eidt and share images directly to social networking sites like Facebook, Instagram, or Twitter. 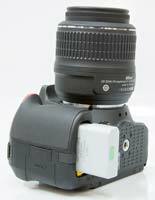 It also makes it possible to control the D5300 remotely via a smart device using the free Wireless Mobile Utility app, and set the focus point using the smart device's touchscreen. The built-in GPS/A-GPS receiver logs location information such as latitude, longitude, and altitude in the image's EXIF data, even when the camera is turned off, allowing you to retrace your steps even when you're not taking photos. The 18-55mm f/3.5-5.6 VR kit lens that Nikon supplied feels fairly well-balanced on the Nikon D5300 and it fits into place with a reassuring mechanical click. It also adds the very important advantage of Vibration Reduction. Nikon bodies don't offer any form of in-camera image stabilisation, unlike similar models from Sony, Pentax and Olympus, so the affordable 18-55mm VR lens is a good starting point if you don't already have any Nikon lenses. The shutter release action on the Nikon D5300 is surprisingly quiet, with a dampened mirror slap that makes this DSLR actually quieter than some rangefinder cameras. Furthermore, there is a Quiet Shutter Release mode, in which the mirror is raised fairly slowly to further reduce the sound it makes. This does, however, introduce some shutter lag, which usually isn't worth the few decibels of difference versus what is already an impressively quiet shutter. The Nikon D5300 follows conventional DSLR design in having a shooting mode dial on the top of the camera, which allows you to select either one of the advanced modes like Manual, Aperture- or Shutter-priority, or a number of scene modes. The Exposure Compensation button is thoughtfully positioned next to the shutter release. Hold down this button with your right forefinger and spin the control wheel on the top-rear of the camera with your thumb to adjust its settings - simple and intuitive. The Effects shooting mode, first introduced on the D5100, now provides 9 different filters that can be applied to both still images and movies. The Night Vision effect is particularly worth of mention, pushing the camera's sensitivity to a whopping ISO 102,400, although a monochrome rather than colour image is recorded. For stills, you can enter Live View mode to preview the effect or simply use the optical viewfinder. For movies, the recording is slowed down (dependent upon the chosen effect) as the camera uses a lot of processing power to apply the effect, leading to footage that can have a rather staccato feel. Note also that the camera sets virtually everything in the Effects mode - exposure, shutter speed, white balance, ISO, file type and quality - so its only creative in terms of the arty effect that's applied. Several of the same effects can be applied to an image or movie that you've taken, though, so you can have the best of both worlds (albeit without the luxury of a preview). The second button sitting next to the shutter release is labeled 'info'. This button is arguably at the heart of the Nikon D5300's ease-of-use, as like its predecessor the camera lacks the monochromatic status LCD of the older D90, so Nikon had to provide a different way to check vital shooting information without having to look into the viewfinder. Enter the info button - pressing it displays virtually all of the camera's main settings on the large rear screen. 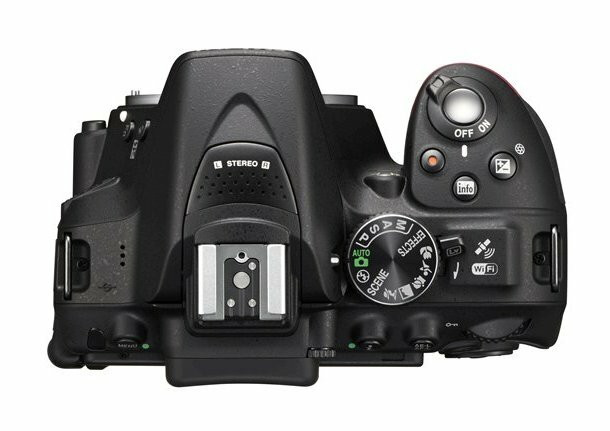 Pressing the "i" button on the rear of the D5300 then allows you to interact with and set the onscreen options, with 14 available in total. The rear articulated LCD screen is hinged at the side rather than the bottom. This fully articulated design is a much more flexible solution, allowing the screen to be folded out from the left side of the camera and folded inwards to protect it when not in use. The screen is slightly bigger than the D5200 at 3.2 inches and higher resolution too, with 1,037k dots, so there's nothing to complain about in this department. The screen also has an anti-glare coating, so that it's usable most of the time outdoors in strong daylight, although it still struggled a little with reflections. The D5300's Live View is accessed in a different and arguably less intuitive way than on the D3200/D7100. 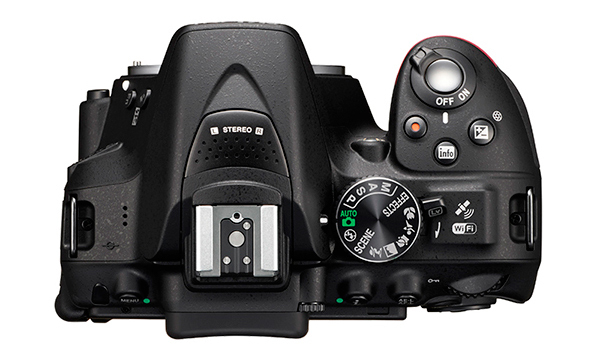 Instead of a combined switch / button on the D3200/D7000, the D5300 has a fore-finger operated spring-loaded switch on top of the body that is pushed downwards and toggles between turning Live View on and off. Positioned next to the Shooting Mode dial, it allows you to enable Live View whilst holding the camera at arms length with one hand, or to turn it off as you hold the camera up to your eye. We'd prefer it to be on the rear of the camera and also to incorporate the Movie record button, in keeping with the D3200/D7100 models. Press the Lv switch and the mirror flips up, the shutter opens and the rear screen displays the scene as seen through the lens. There is a red rectangle in the middle, which you can move practically anywhere in the frame. When in manual focus (MF) mode, you can magnify into this rectangle in a number of steps by repeatedly pressing the button marked with a loupe icon, but this magnification seems to be at least partially interpolated. This means that you cannot see detail down to the pixel level, unlike some competing cameras. Fortunately, MF is not the only focusing option in Live View, at least as long as you are taking stills. Single-servo AF (AF-S) and Full-time-servo AF (AF-F) modes are also available and, while slow, they tend to be accurate. Both modes can also be used in connection with face detection. 'Face-priority AF' had no problem finding and keeping track of human faces as long as they were facing the camera, but acquiring focus was another story - very, very slow. Live View must also be entered to shoot movies. After pressing the Lv button and optionally presetting the aperture and focus, you can start recording video by pressing the dedicated Movie Record button on top of the camera next to the shutter release. The camera records full high-definition, wide-screen video in 1920x1080 pixel resolution, at a frame rate of 60p/50p/30p/25p/24p, in AVI format using the motion JPEG codec. As with Live View, contrast-detect AF is possible whilst shooting movies, although as with still images there's an audible whine as the camera refocuses and it's still too slow to focus on any fast-moving subject, so much so that we suspect most serious users will use manual focusing instead. Although the D5300 can automatically focus during video recording, it's just not fast enough to warrant regular use. You can set both the aperture and the shutter speed during movie recording, although the slowest shutter speed is limited to 1/30th second, plus exposure compensation and AE-Lock can also be set. Out of the box the D5300 can record stereo sound via its built-in microphone with three different levels of sensitivity on offer, and improved sound can also be recorded using an optional external microphone. The maximum size of a single video clip is 2 gigabytes which, given that movies occupy about 100 megabytes of storage space per minute, would theoretically translate into about 20 minutes of continuous recording. The D5300 has a proper through-the-lens optical viewfinder with a slightly improved magnification of 0.82x, on par with most of its rivals. The Nikon D5300's 39 auto-focus points are permanently marked on the focusing screen, whereas the compositional grid lines can be called up via a menu option. Two warning signs - telling you that the battery is running low or you have forgotten to insert a memory card - may also appear in the form of overlaid icons when appropriate. Below the finder is a traditional monochromatic status bar showing practically all relevant shooting information (including the ISO sensitivity, if so specified in the menu). As stated above, the Nikon D5300 has 39 auto-focus sensors, out of which 9 are cross type. The other thirty are of the line variety, consequently being only sensitive to either vertical or horizontal detail, but not both. In practice, this did not turn out to be a real problem, with the camera typically locking focus on the subject quickly and easily, no matter which AF point was selected. In the viewfinder, the active AF point appears in red, which is easy to see. Selecting the active AF point is done by way of the four-way pad - except if you choose Auto Area AF - again a simple and intuitive solution. In low light, the AF sensors are helped by an AF assist lamp located on the front plate of the camera. The 2,016-pixel RGB metering sensor used by the D5300 is again identical to the system used by the more expensive D7100 model. This provides precise data to the camera's Scene Recognition System, which optimises exposure, autofocus and white balance immediately before the shutter is released. The Nikon D5300 only has one control wheel and there are no dedicated buttons for controlling ISO sensitivity, white balance, metering or AF mode. The Fn button can be reprogrammed to perform ISO selection or white balance adjustment (or one of a few other functions such as file quality specification), but the others still have to be set through the main info screen, called up by pressing the [ i ] button top-right of the rear display. 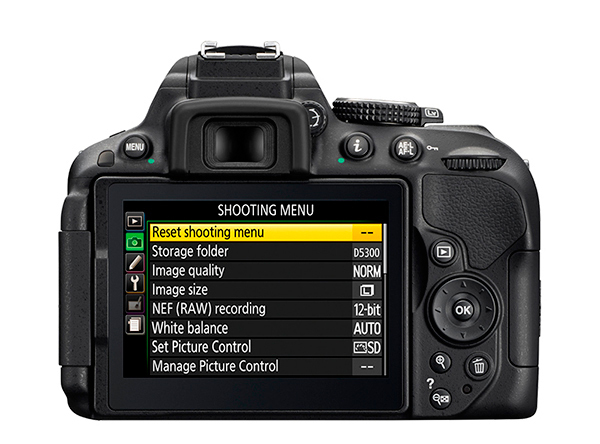 With practice, performing adjustments via this screen becomes fairly quick and easy, but it's not as efficient as the older D90's dedicated controls. Most of the camera's rear controls are scattered, seemingly almost randomly, to the right of the D5300's large folding screen. While we can understand the need to locate them to accomodate the 3 inch LCD, the positioning of the Zoom In and Zoom Out buttons in particular isn't very intuitive, being operated with your right-hand thumb, and right next to the Delete button. As the D5300 isn't a very complex camera in terms of the number of external controls, it thankfully doesn't get too confusing, but is something to consider from an ergonomic point of view. For the images that you've already already captured, the Nikon D5300 offers a broad range of retouching tools, including post-capture D-lighting (useful if you forgot to turn on Active D-lighting before capture), red-eye correction, trimming, monochrome conversion, different filter effects, colour adjustments, image resizing, image overlay, in-camera raw processing, quick auto retouching, straightening of crooked pictures, lens distortion correction, fisheye, colour outline, colour sketch, selective colour, miniature effect, and perspective control. Many of these functions make it unnecessary to buy specialised computer programs or plug-ins and spend hours in front of a computer to achieve a desired/popular effect. The Nikon D5300 is powered by a proprietary EN-EL14a Lithium-ion battery, good for 600 shots, and records videos and image files on SD/SDHC/SDXC cards. As we noted in our D5200 review, we would really have liked to see Nikon add a second card slot for Compact Flash cards, so that owners of higher-specified Nikon DSLRs who buy a D5300 as a second body can use their existing memory cards. It also lacks the dual-SD slots of the D7100. As far as connectivity goes, there are USB/VideoOut and Mini HDMI ports as well as an accessory terminal for the connection of a wired remote or a GPS unit, all sheltered behind a door on the left side of the camera, when viewed from the back. Los Angeles, CA -- ( SBWIRE) -- 11/01/2013 -- Holidays are nearing, and lots of people are searching for good cameras to capture memories for the upcoming holiday celebrations. For Black Friday and Cyber Monday, lots of people will be out shopping in stores or browsing online to get good discounts for electronics. The Nikon Nikon D5300 Cyber Monday Deal is a part of Nikon's camera line built for advanced beginners. 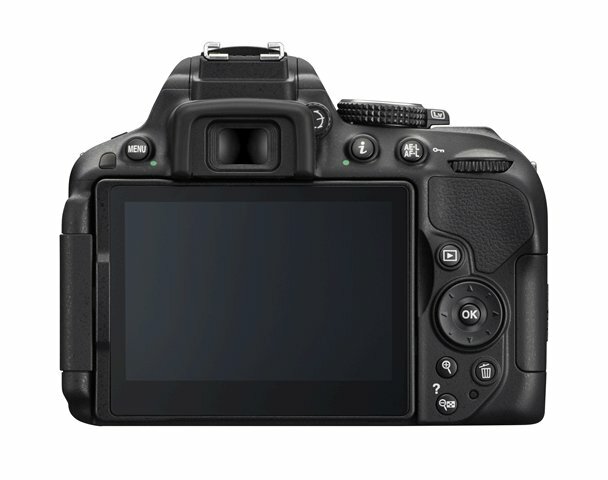 It has better features than its entry-level counterpart which is the D3200. 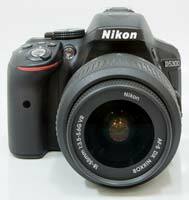 Hottydeals now recommends the Nikon D5300 for the holidays. 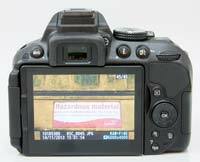 People interested about Nikon D5300 deals can go to http://hottydeals.com/nikon-d5300-deals/. Dennis, a spokesperson for Hottydeals.com, says, "There are a lot of DSLR cameras out there that are built for beginners. Although the Nikon D5300 is made for advanced users, it can also be easily used and learned." The Nikon D5300 has been redesigned and the LCD has increased in size and width. It has a WiFi connection without the need for a dongle. It also has added extra effects and has a better magnification on it. The battery life has also been boosted to ensure that users can use their cameras anywhere in the world. It also features a GPS system. The Nikon D5300 is for consumers who have some basic knowledge about photography and are ready to take it to the next level. However, this camera can still be good for beginners as it only takes some time and practice for them to learn. The camera can also record HD videos. It is a reliable device. Dennis also says, "The camera is light, delivers sharp images, and is also quite comfortable on the hand. A lot of people will love owning this camera as it makes them feel like a professional, even in the amateur world. There may be a lot of options for other cameras, however, this is the one that works best in crowded areas." Hottydeals recommends and features different products ranging from clothing to cameras. Information and details are available on the website to help people have an informed decision when looking for products for the holiday season. While the serious enthusiast is unlikely to be swayed into buying a Nikon DSLR over a Canon model purely because the Nikon camera is newer, the reality is that at the non-premium end of the market this is how some people make their buying decisions. 'Newer' must mean 'better'. This demand for the 'new' explains why we see such short product cycles in the camera market, and why manufacturers feel the need to introduce even small advances in technology or feature sets in cameras with completely new names - rather than a 'Mark II' type of naming format. Those familiar with Nikon's range of DSLRs may not see the sense in the company's introduction of the new D5300, especially as Nikon will maintain the D5200 alongside this model in the range - new and old together. By doing so, though, Nikon expands the number of cameras it has on offer and the number of price points it can cover, while also being able to have a model that can carry a 'New' sticker, and which introduces new features to the price band in which it will sit. That's not to say that the Nikon D5300 isn't different to the D5200, though, as a new processor, new body design and the integration of wireless communications do genuinely bring additional benefits to the photographer. Nikon is very pleased that it has achieved a new way of constructing camera bodies, which it describes as a 'monocoque'. Instead of there being a chassis, onto which the components and the body shell are attached, the D5300 is designed to have everything screwed to the insides of the body form itself: exoskeleton, rather then the usual endoskeleton. The D5300's body shell is also made of a new material, although Nikon won't say what that new material is - just that it is new. The upshot is that the body is less heavy than it might have been, and is 25g lighter, including the battery, than the camera it doesn't replace, the D5200. I'm not entirely sure that when I used the camera I could appreciate the exact weight loss that has occurred, but I was able to enjoy the fact that this is truly a lightweight DSLR, of the type that we might not mind carrying all day, over the shoulder, in a bag or in a large pocket. The body is very small too, although it is balanced with a reassuringly large grip for the right hand. It seems ironic that a small and light camera should need a large grip, but I found it allowed me to be aware I was carrying the camera, and should a larger lens be attached it will help to support the forward pull of such a weight distribution. The principal changes in this model are of the sort that will only be proved in testing, but at this stage their potential is worth pointing out. Using the higher-capacity Expeed 4 processor, Nikon claims it has been able to reduce noise in its images through the use of more complicated calculations. A related benefit is that now noise levels are lower the company is comfortable offering a higher ISO setting - the Nikon D5300 allows ratings of up to ISO 25,600. More complex calculations also provide the potential for better white balance assessment in automatic modes via a more comprehensive assessment of the scene, and a better rendition of colour overall. Lower noise should also lead to better resolution of detail from the 24.2-million-pixel sensor, as should Nikon's decision to do without the micro-blurring effects of a low-pass (anti-aliasing) filter. Leaving the low-pass filter off the sensor has become very fashionable, and I suspect it will be a great draw for many photographers. Moiré in images created by a sensor with 24 million pixels, even an APS-C-sized sensor, is still something that is quite likely to occur, but there is also plenty of software to correct it after the event. Obviously, I couldn't test the battery life of the camera, but we should take the increase as good news. I will also have to wait to test the Wi-Fi and GPS capabilities of this new model, but neither can be held as negative points just for their inclusion. The Wi-Fi integration means users will be able to control the camera from an Android or iOS device, and will be able to wirelessly transfer images for viewing, editing and sending while on the go. It would be easy to dismiss the Nikon D5300 for being too similar to the D5200, but that really isn't the point. There is not much wrong with the D5200, and the changes that this new model brings can only make it better. Perhaps Nikon could have called it the D5200 ll, but I'm not sure it matters one bit. 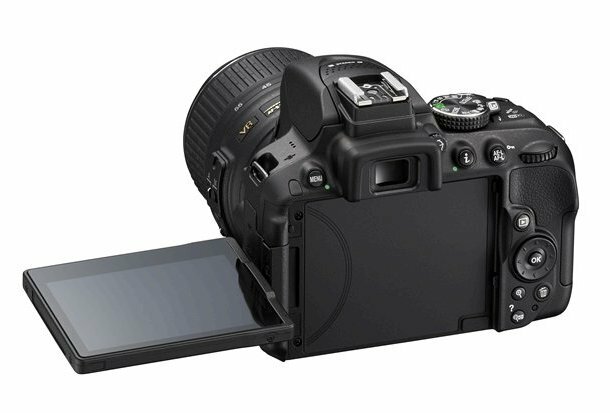 Nikon just introduced the D5300 DSLR camera, which offers an enhanced 24.2-megapixel DX-format CMOS sensor, EXPEED 4 image processing, Vari-angle LCD, GPS and the convenience of built-in Wi-Fi. The mid-range SLR is compact and lightweight (16.9 oz. ), and can easily be packed for a day trip or a planned getaway. The small body of the D5300 affords the photographer the freedom to travel while still being easy to handle and comfortable to use. The D5300 is Nikon's first D-SLR to feature built-in Wi-Fi, allowing the user to share high quality photos instantly. The Nikon D5300 sends images to the user's smart device, allowing them to share their D-SLR quality photos through e-mail and social media. The Nikon D5300 also includes built-in GPS, another first for Nikon D-SLRs. Now the user can geotag images and allow others to see where life has taken them. The enhanced 24.2-megapixel CMOS sensor delivers stunning images and HD videos with heightened clarity and detail due to the removal of the optical low pass filter (OLPF). Its 39-point high-density autofocus system with 9 cross-type sensors quickly locks onto your subject, and Nikon's unique 3D-tracking uses the 2,016-pixel RGB sensor to recognize and follow it across the frame. Amazing Low Light Performance - For clean, sharp details even in the most challenging lighting conditions including night games and dimly lit restaurants, the Nikon D5300 covers a wide ISO range of 100-12,800 and is expandable to ISO 25,600. EXPEED 4 Image Processing - Nikon's most recent image processing engine drives the rapid response and swift performance of the D5300, while maximizing energy efficiency, reducing image noise and delivering true-to-life colors. Scene Recognition System - To further help users capture the image they intend, the Nikon D5300 features Nikon's Scene Recognition System and 2,016-pixel RGB metering system to analyze and recognize the scene. Utilizing these systems results in adjustments to exposure, AF and white balance to deliver the best photo possible, whether it's a landscape or portrait. 39-Point AF System - Nikon's quick and precise 39-point AF system works with the Scene Recognition System to accurately acquire and track subjects throughout the frame, resulting in tack-sharp images. Kids too active to pose for a photo or pets chasing after a toy are easily captured in brilliant sharpness for memorable photos. 5 Frames-Per-Second - While using the optical viewfinder or in Live View, capture great moments that would have otherwise been missed with the D5300′s 5 frames-per-second (fps) rate. 3.2-inch Vari-Angle LCD monitor - Whether shooting above a crowd or getting low to capture the details of a flower, users can explore new shots from a dramatic point of view with the large 3.2-inch Vari-angle LCD monitor. This super sharp (1,037K-dot) screen allows photographers to easily make camera adjustments and read menus, while also allowing them to compose the photo they want clearly when shooting from high or low angles. The rotating LCD makes it easy to capture "selfies" at an arm's length away or frame creative perspectives when capturing still photos and HD video. Full HD 1080p Video Capture - Create movies fit for the big screen with Full HD 1080p video capture at 60p with built-in stereo, wide ISO range for high quality videos in any light and improved full-time AF to keep the subject in focus. NIKKOR Compatibility - The Nikon D5300 is compatible with Nikon's legendary NIKKOR lenses and powerful system accessories, further adding versatility and creativity. The Nikon D5300 kit with the AF-S DX NIKKOR 18-140mm f/3.5-5.6G ED VR lens will be available in October 2013 for$1,399.95. Available colors include Black, Red and Gray.